The Oliver Animal Hospital at the Sedgwick County Zoo is an area that guests rarely have the opportunity to see. The veterinary team provides the Zoo’s nearly 3,000 resident animals with everything from preventive dental exams to life-saving surgeries in order to keep them happy and healthy. Last year, the medical team received one of their more unique cases to date. 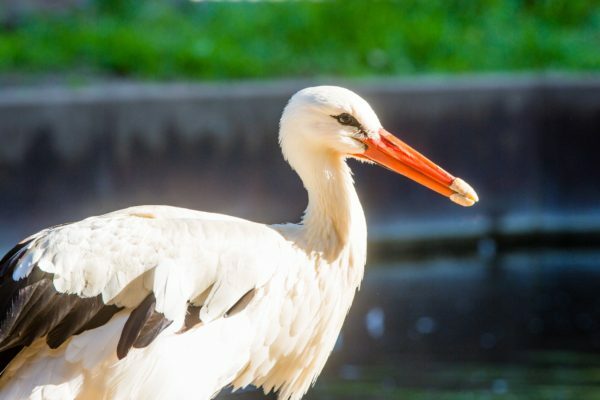 On the morning of April 1, 2018, zookeepers noticed blood on the bill and feathers of a white stork from the Asian habitat. The stork was immediately delivered to the Oliver Animal Hospital, where it was determined that a part of its bill had been broken off overnight. 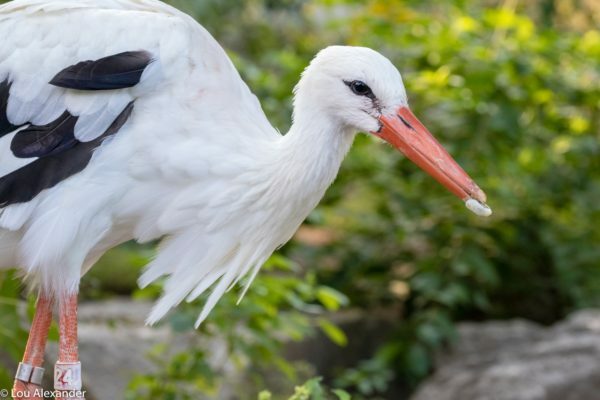 Once the stork was admitted to the hospital, he was put on a treatment plan consisting of pain medication, antibiotics and nutritional support to get him back to his normal, healthy self. Typically, birds that damage or break their bills will adapt to the change quickly and learn to eat on their own again. This stork, however, did not. After about a month of requiring assistance to eat, the hospital decided they needed a better solution. With the help of Board Certified Veterinary Dentist, Dr. Doug Winter, they were able to make a prosthetic bill tip for the stork to help him get back to his normal eating habits. The prosthesis was made out of composite resin, the same material dentists use to make tooth fillings. After almost two hours, the procedure was complete and the stork was ready to figure out his new addition. The stork began picking at the ground almost immediately after his surgery, trying to get used to the prosthetic. A few days later, the stork was ready to start eating live fish on his own again. Once he got even more comfortable, he was able to eat his regular diet of fish, mice and insects without any keeper or veterinary assistance. Fast forward to late August 2018, the stork began to have trouble eating on his own once again. After a closer look, keepers saw that the top prosthetic was coming loose. He was admitted to the animal hospital shortly after to have the loose prosthetic removed. Once removed, the veterinarians noticed that the bill had healed very nicely from having the protection of the prosthetic. The stork was hospitalized overnight for observation to make sure there were no more complications. Keepers were thrilled to see him back to normal and eating almost right away. Now, the stork is back on exhibit once again just as happy and healthy as ever. Guests can still see him flaunting his bottom prosthetic, as it is still firmly attached and will stay on until it’s ready to come off on its own.